Yesterday, we started the treatment of a manky swamp pool that we had just uncovered from winter. 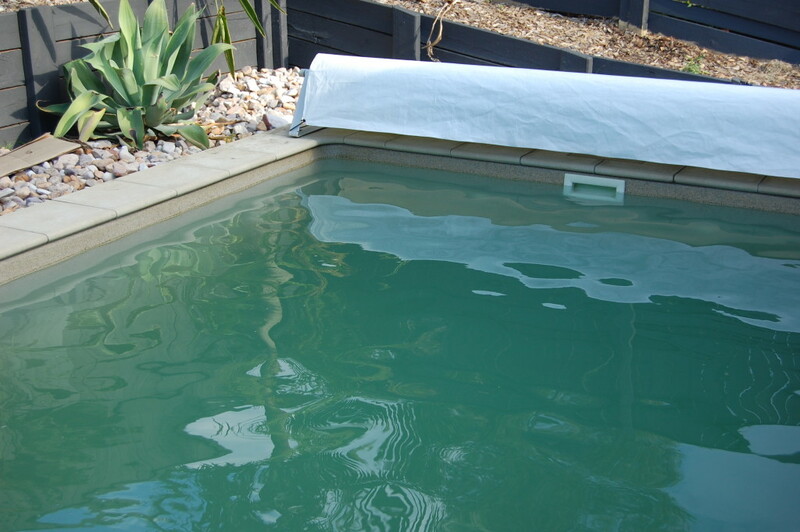 Only 24 hours later, we are seeing a substantial improvement in the clarity and colour of the pool. So far, this pool has only had 4 hours of filtration (2 hours yesterday afternoon, and two hours today), and 5 litres of pool strength chlorine added. We cleaned out the filter once today. Using a FAS-DPD chlorine test kit (now available in Australia!) allows you to dose your pool precisely. This is really important because if you don’t use enough, your pool will take forever to clean, and if you use too much, the life of your pool equipment will be dramatically shortened. If electricity or noise is a concern when cleaning up the pool, make sure to vacuum the pool first instead of just running the filter. Also make sure that any brushing that happens is performed after the vacuuming, this will clear the most algae possible in one hit, as much of the dead algae will have sunk to the bottom. See below for a direct comparison of the two days. Although the lighting conditions were different on both days, you can still see an impressive difference between the two. We’ll keep following this pool until the water is crystal clear. Check out Part 3 for more tips. This entry was posted in Help! and tagged green algae.